Our last morning in Santa Barbara started with a light breakfast and a walk along the harbour. The reason for the light breakfast was that we had planned to call at In-n-Out burger for lunch. We’d chosen the In-n-Out burger on Sunset Boulevard, but also a diversion along Mulholland Drive. After a few wrong turns we eventually got the right road, which was suitably twisty with great views from between the mansions and our first glimpse of the famous Hollywood sign. After our Double Double burgers, which were good, but I thought didn’t quite live up to the hype, we drove via Hollywood Boulevard to the Griffith Observatory for more views over Los Angeles, including the Hollywood sign. From this vantage point you can really see just how big the city is – we couldn’t even see the ocean, yet the city stretched out all around us. By this point it was mid afternoon, and wary of the notorious Los Angeles traffic we set off for Santa Monica and the Georgian Hotel on the sea front. En-route we passed or drove on famous streets such as Santa Monica Boulevard, Wilshire and Rodeo Drive. Upon checking in we were told that our room had been upgraded to a suite after I’d tweeted the hotel letting them know it is our honeymoon – I will have to try that at other hotels! We spent the evening hanging out around the hotel, Santa Monica pier is only a couple of blocks away and felt more like the piers I’m used to from the UK with arcades and amusements. 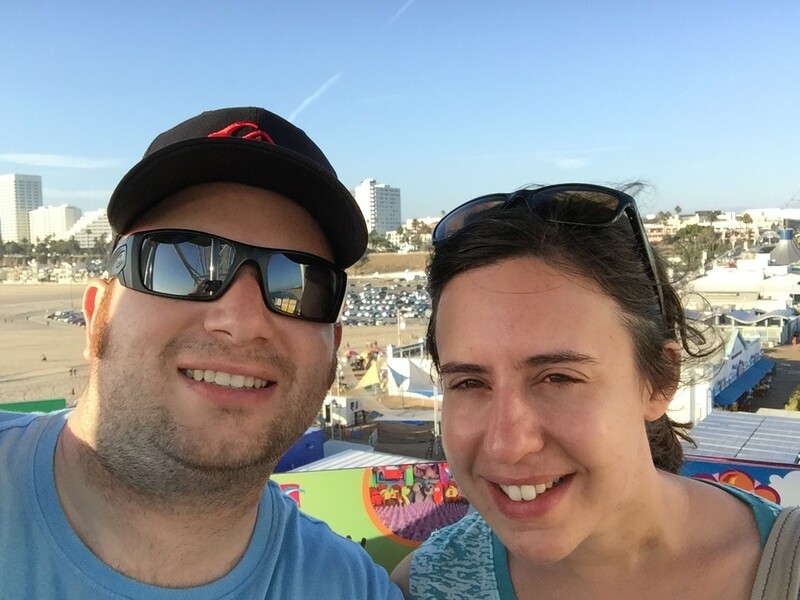 We went on the big wheel for a view down the coast to Venice Beach and beyond. We watched the sunset from the veranda at the hotel, drinking cocktails- a great way to end the day. This entry was posted in Roadtrips and tagged California, Honeymoon, iPhone, Photo by Lewis. Bookmark the permalink.